This simple recipe for Fresh Curried Tuna Salad can be used in several different ways. It is a nice spin on traditional tuna salad. Choose high quality fresh tuna – fresh really does make a difference. The first time I tried this recipe, it was immediately taken back and put on my restaurant’s menu. It became a best seller. While I no longer have my restaurant, it is a permanent part of my recipe repertoire. Yes, it is that good. Try it, you’ll see! Side note: You can use canned tuna for this salad if you want. 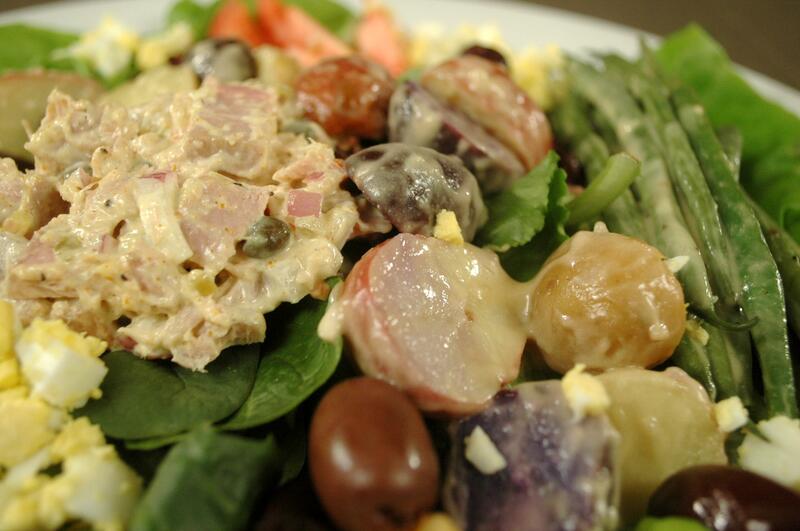 While the taste and texture of fresh tuna is amazing, canned tuna also makes a tasty salad. 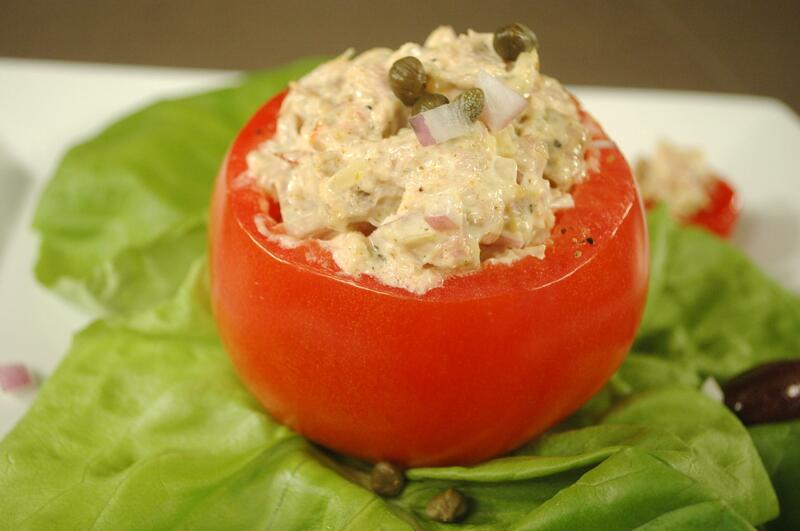 Squeeze the lime juice into the dressing if you are using canned tuna instead of fresh tuna. For a complete twist on everything, substitute Salmon for tuna. Squeeze the lime juice over the fresh tuna, sprinkle with salt and pepper. Place the fish in a 350°F oven for about 10 minutes – for 1″ thick piece of tuna. Time it more or less, depending upon the thickness of the fish. You want a trace of pink left in the fish so as not to over-cook it and make the fish dry. While the tuna is cooking, mix all remaining ingredients in a mixing bowl. Remove the fish from the oven. Cut into medium or small dice and cool. Add the tuna to the dressing and serve as desired. Garnish plate with lettuce, chopped eggs, etc. Salad Nicoise is a classic French salad. 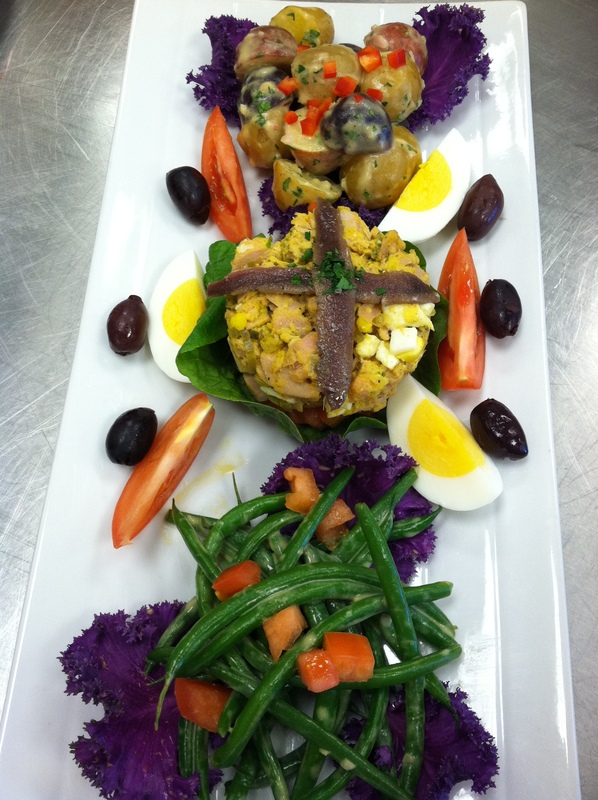 It is presented with tuna, potatoes, green beans, eggs, tomato and a wonderful light vinaigrette seasoned with mustard. To create this lovely salad, boil some new potatoes in salted water until done. For this salad, I used tri-colored new potatoes: white, red and blue. It makes an attractive color contrast on the plate. Once the potatoes are drained, dress them while still warm with Mustard Vinaigrette. Cool. Steam some green beans until tender; dress these with the Mustard Vinaigrette white still warm. Cool. Line a plate with lettuce leaves and a small mound of cut salad greens. Arrange the plate with Fresh Curried Tuna Salad, potatoes and green beans. Complete the salad presentation with Nicoise or Kalamata olives (pitted of course), tomato wedges, chopped hard-boiled eggs and cucumber and anchovies, if desired. Salad Nicoise makes a great dinner entrée. This is one of my all time favorite meals. If you ever find yourself in Paris, or anywhere in France, it is highly recommended you indulge in one there. They vary somewhat from region to region, but are always delicious. 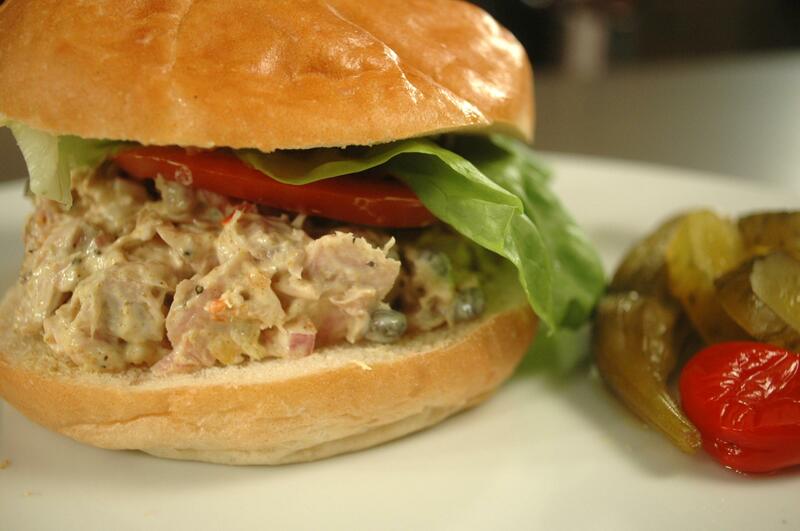 I hope you enjoy making and eating Fresh Curried Tuna Salad. Whisk all ingredients, but not the oil, in a large mixing bowl. Whisk in the oil until well blended. This entry was posted in Recipes and tagged curried tuna salad, dinner salad, entree salads, fresh tuna, hard boiled egg, Niçoise salad, Salad, salads, sweet pickle relish, tablespoon capers, Tomato, Tuna, Tuna salad, tuna time. Bookmark the permalink. I just got hungry! Beautiful plate up of the nicoise, tuna, and potatoes. Such lovely photos. I’m going to try this salad as soon as I get fish from the fish store or more canned tuna – whichever comes first. It looks very tasty! BTW how much mayonnaise do you recommend? It doesn’t quite say. Same thing with the portion of tuna. Use as much mayo as you think it needs to hold together and provide some moisture. Some people like more and others like less. Same with the tuna, although I suggest 6-8 ounces per person. If you use canned tuna, I find one can will serve two quite nicely. oh, Tia, I just looked again at the recipe and realized two things! Thanks for your query so I could clarify.